This stress raises the risk of a deadly heart attack or stroke, according to the NHS. It’s not always possible to know if you have high blood pressure, but you could be at risk if your urine has a slight red tinge to its colour. 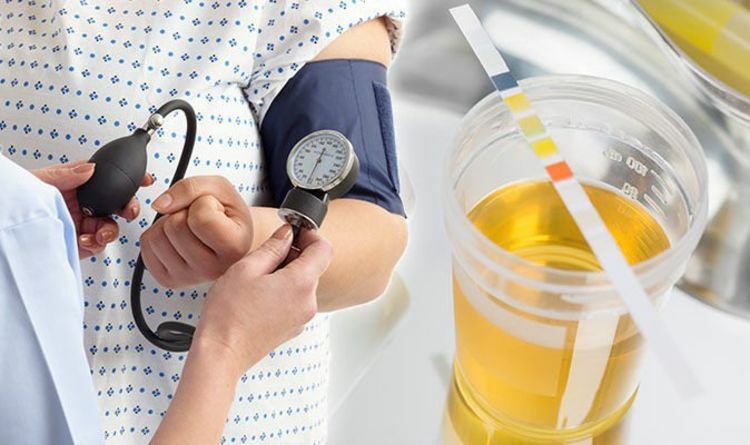 Finding blood in your urine is an early symptom of high blood pressure, according to medical website WebMD. While it’s usually nothing to be worried about, blood in urine – or haematuria – should be checked by a GP. The urine won’t necessarily appear bright red. It could also look pink or a dark brown. “Blood in your urine could come from anywhere in the urinary tract – the bladder, kidneys or urethra,” said the NHS. “Blood in urine must be checked out because it can be a sign of cancer. You should also speak to a doctor if you only find a small amount of blood in your urine, it added. At your doctor’s appointment, your GP will ask for a urine sample or arrange a blood test. They may also check your blood pressure if you think you’re having other warning signs of hypertension. High blood pressure doesn’t often have any tell-tale signs, but if you have extremely high blood pressure, there are some warning symptoms to look out for. The most common high blood pressure symptoms include chest pain, having a severe headache, and vision problems. Many people have hypertension without even knowing it, warned the NHS. The only definitive way of knowing if you have high blood pressure is to get your blood pressure checked. Speak to a doctor or pharmacist to have your risk of hypertension revealed. You could lower your chances of high blood pressure by eating a healthy, balanced diet. Regular exercise, as well as eating at least five portions of fruit and vegetables every day, is crucial to avoiding hypertension.